Last weekend, half a million people from over 136 cities around the globe marched in protest to loathsome poachers annihilating nature. Join me from Los Angeles, California as I rally the troops for The Global Elephant, Rhino, Lion March . Video by John Lafferty. Fifteen percent of the human race, or 1.1 billion people, arise each morning to make their livelihood by killing nature. Intrepid "Earth Warriors" from every habitable continent are demanding an end to this vile ecocide. "Earth Warriors" protest in San Francisco's China Town. Photo Credit: The Global Elephant, Rhino, Lion March. Each day, more and more people are joining forces to protect the forests and oceans, and their elephants, rhinos, lions, sea turtles, bluefin tunas, sea horses, albatross, dolphins and whales. Humans cannot live on this planet, are only home, without nature. We know the strength of all ecosystems depends upon its biodiversity, and that all biodiversity is interconnected. Since 1970, Earth has lost 50 percent of its wildlife to looting. Four hundred billion dollars a year in live and dead animal parts including elephant tusks, rhino horns, sea turtle shells and eggs, sharkfins and supplying dolphins for dolphinariums are run and profited by organized crime. The Yakuza, Syndicate, Triad's, Cartel and Mafia are laundering $400 billion, each year, through the international banking system. Poachers are quickly impoverishing Earth leaving all children a bleak chance for survival. Write a letter to President Obama and ask him to support measures to stop poaching on the land and under the sea because its quickly killing our planet. 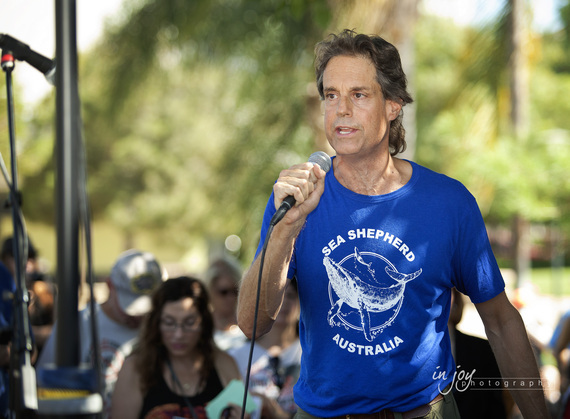 Please learn more about Rainforest Action Network, Deforest Action, the Orangutan Project, Mission Blue, Ocean Alliance, Australia for Dolphins and Sea Shepherd Australia. Join Earth Dr Reese Halter on his crusade to protect our planet by watching Earth Calling SOS.